I keep trying new things for breakfast, bless my heart. Despite how healthful they sounded, chickpea, date and coconut triangles were not my thing, being too soft and a bit bland (I’m not sure whether adding chocolate chips would have saved them; as it was, I think the Fox was the only one who liked them). 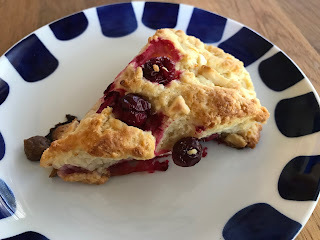 I also made cranberry, orange, and white chocolate scones, which were in fact delicious (pieces of white chocolate ended up basically caramelizing in the oven and were the best part), but somehow I don’t have really good pictures. So enter these fresh strawberry muffins. Because they contain fresh fruit, they don’t keep very well, so I preemptively froze most of them – and I can attest that those are delicious after 30 seconds or so in the microwave. These muffins are topped with cinnamon sugar, but I think you could swap the cinnamon for nutmeg or cardamom or omit it altogether. And you could probably use other berries, depending on what you have on hand. It’s a simple, versatile recipe! Preheat oven to 400 °F. Grease a muffin pan or line the wells with paper liners. Whisk together the flour, baking powder, and salt in a small bowl. Set aside. Cream butter and sugar. Add egg and vanilla and mix well. Add flour mixture and milk alternately to butter mixture. Gently stir in strawberries. Spoon batter into prepared muffin pans. Bake for 20-25 minutes or until a toothpick inserted in the center comes out clean. I think that cooking is my hobby and passion. When I was working at the office I didn't have enough time to cook was very upset about this. I decided to quit and work at home. Freelancing can be fun and I have a lot of time for my hobbies and personal needs.